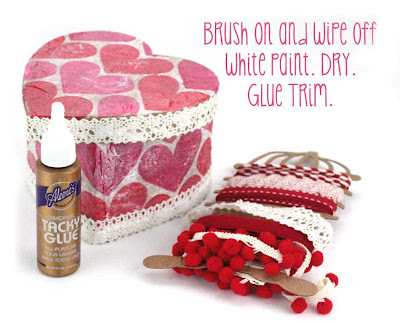 I am really feeling the love for Valentine's DIY this year. 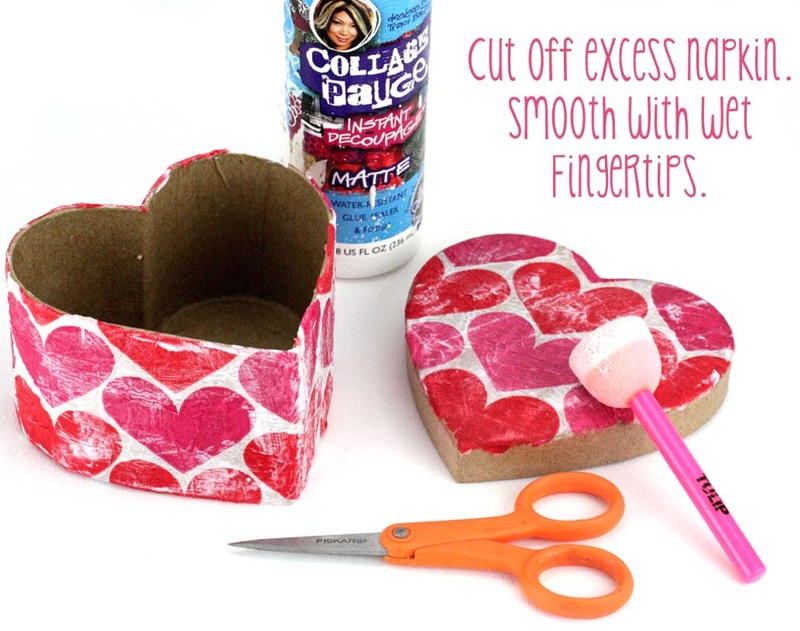 This DIY Valentine's Gift Box is a quick and easy way to personalize a gift for someone you love. 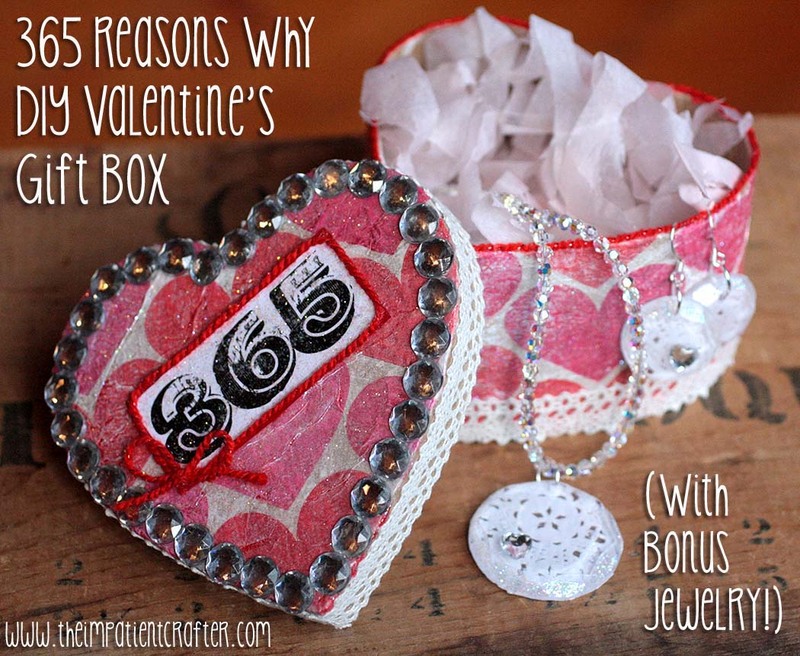 The idea is to write 365 reasons why you love them and tuck them into this pretty little box. Then they can pull out a reason every day to remind them that they're loved. Yup, I'm corny like that. How about you? If you just aren't that into writing 365 actual reasons why, you can just let the box speak for itself and tell them that you love them every day of the year. Tuck in a little decoupaged jewelry for fun! 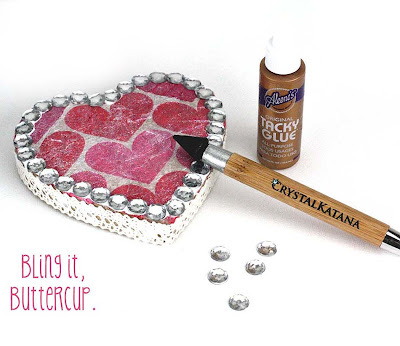 I have the tutorial for the jewelry over on The Impatient Crafter blog. You can get the 411 on the DIY box here. 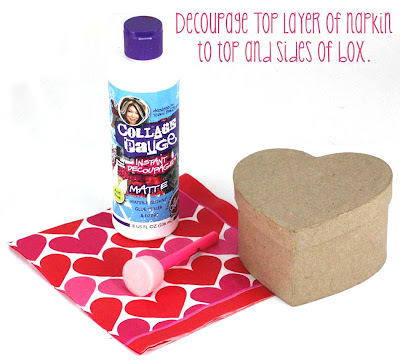 You'll need a small kraft paper heart shaped box and some layered Valentine's themed napkins, pull off the top layer and use that. These were tissue paper, I got them at Michaels. 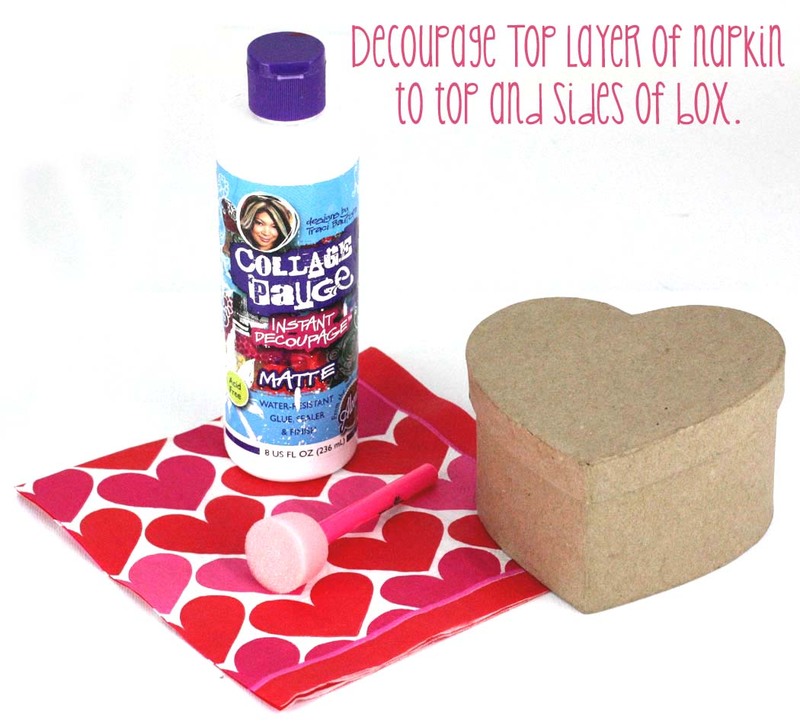 Decoupage the lid with and the sides of the bottom with the paper and Collage Pauge matte. Use scissors to cut off excess paper, it's okay if it's a little messy, we'll cover it up! Brush on a thin layer of white acrylic paint, wipe off with a wet paper towel for a white washed finish. Use Tacky Glue to attach lace ribbon trim around edge of top and bottom of box. Allow to dry. Brush on a layer of Collage Pauge sparkle. Allow to dry. 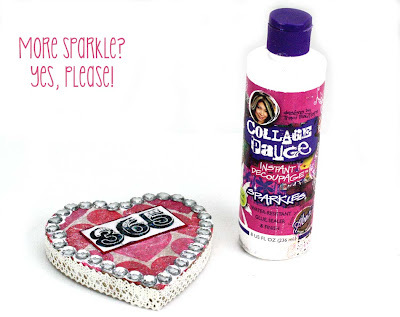 Glue on some faux gems using Tacky Glue. I used my friend Kellie DeFrie's new Crystal Katana tool for easy bling application without getting sticky fingers! Print 365 using Barbershop Font. 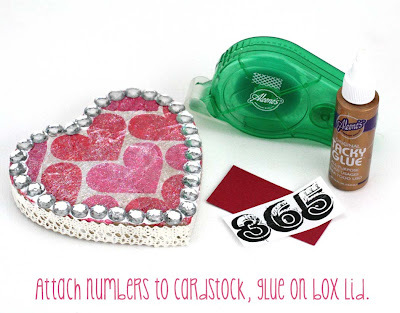 Cut out, attach to cardstock using Aleene's Tacky Dot Runner. Attach cardstock to box lid with Tacky Glue. 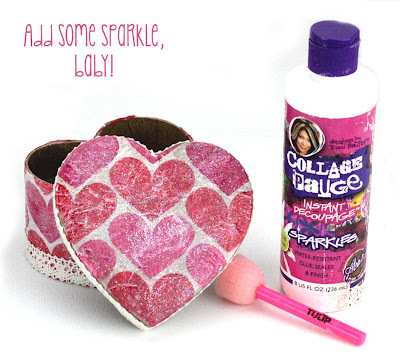 Brush on a layer of Collage Pauge sparkle, it will dry flat, don't worry! 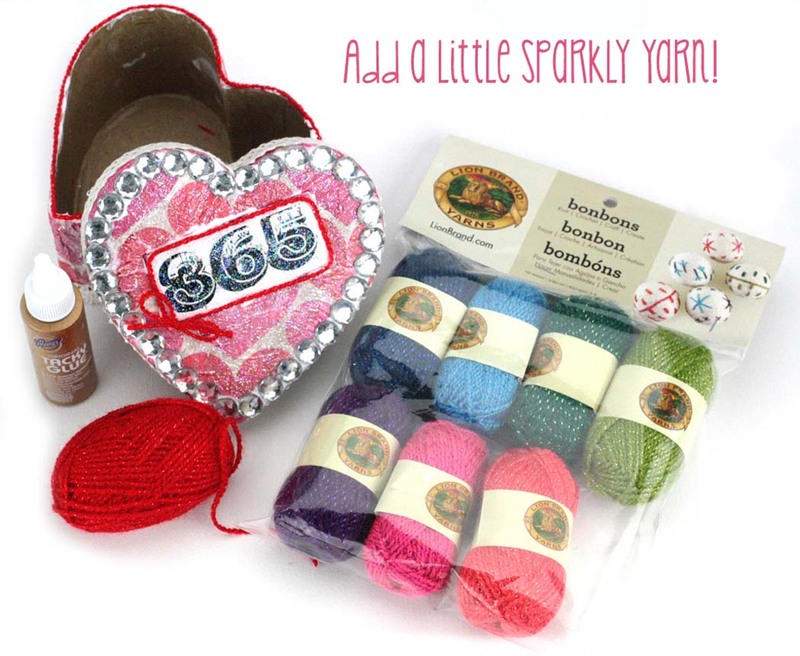 Glue some Lion Brand red sparkly bonbon yarn around edge of numbers and top of inside box edge using Tacky Glue. Allow to dry! 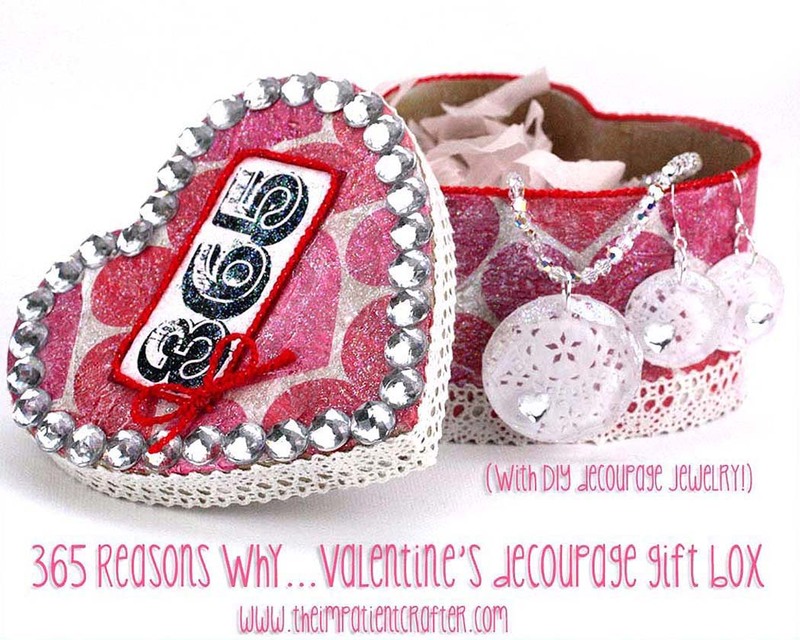 Tuck some handcrafted decoupage jewelry into your fabulous new DIY Valentine's Gift Box for a little extra added DIY awesome! Very girly and gorgeous! I really like that lace ribbon! 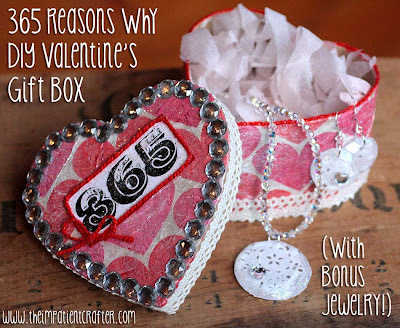 This would be a perfect jewelry gift box for valentines! Thanks for sharing Margot! This is SO cute. Wow, I wonder if I can get the supplies and do it tonight. I found this Valentine's craft guide ( http://www.inktechnologies.com/blog/a-crafty-and-creative-valentines-day-guide/ ) this weekend, and I've made those. This would be the perfect pair to them!